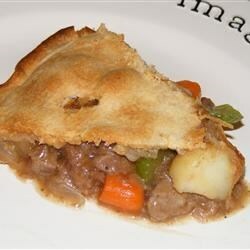 "A great deep dish meat pie made with potatoes, carrots and peas in a rich gravy. Lamb chicken or pork can be used in place of beef. A great recipe for leftover meat!" Preheat the oven to 425 degrees F (220 degrees C). On a lightly floured surface, roll the pie crust out into a 12 inch circle. Set aside. Melt margarine in a saucepan over medium heat. Add potato and onion, and cook until the onion is tender, but not brown. Sprinkle the flour over the mixture, and stir to blend. Season with oregano, black pepper and garlic powder. Pour in the beef broth, and add the peas, carrot and beef. Bring to a boil. Transfer the mixture to a 2 quart casserole dish, and place the pastry over the top. Cut slits for steam, and flute the edges. Place on a baking sheet, and bake for 25 to 30 minutes, or until crust is golden. Let stand 10 minutes before serving to thicken. Agreed! This is awesome and easy! I used leftover sirloin steak and mushroom marsala sauce. Add estra potatoes and other veggies! Used two med. size potatoes, 2 carrots, and leftover prime rib roast. Also did a double crust pie. Added about a cup of leftover gravy also. Very good, hubby loved it. Very similar to our Canadian Meat Pie. Substitute the cooked/leftover beef for ground pork and ground beef. Saute until cooked complete the way this recipe does it.